Most people take breathing for granted. People with certain illnesses may have breathing problems that they deal with on a regular basis. This article discusses first aid for someone who is having unexpected breathing problems. Breathing difficulty is almost always a medical emergency. An exception is feeling slightly winded from normal activity, such as exercise. 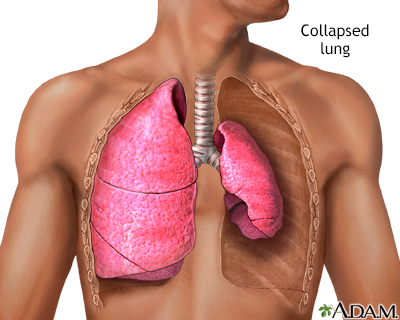 There are many different causes for breathing problems. Common causes include some health conditions and sudden medical emergencies. If an allergy is causing the breathing problem, they might have a rash or swelling of the face, tongue, or throat. If an injury is causing breathing difficulty, they might be bleeding or have a visible wound. Check the person's airway, breathing, and pulse. If necessary, begin CPR. Help the person use any prescribed medicine (an asthma inhaler or home oxygen). Continue to monitor the person's breathing and pulse until medical help arrives. DO NOT assume that the person's condition is improving if you can no longer hear abnormal breath sounds, such as wheezing. If there are open wounds in the neck or chest, they must be closed immediately, especially if air bubbles appear in the wound. Bandage such wounds at once. A "sucking" chest wound allows air to enter the person's chest cavity with each breath. This can cause a collapsed lung. Bandage the wound with plastic wrap, a plastic bag, or gauze pads covered with petroleum jelly, sealing it except for one corner. This allows trapped air to escape from the chest, but it prevents air from entering the chest through the wound. Give the person food or drink. Move the person if there has been a head, neck, chest or airway injury, unless it is absolutely necessary. Protect the neck if the person must be moved. Place a pillow under the person's head. This can close the airway. Wait to see if the person's condition improves before getting medical help. Get help immediately. Call 911 or your local emergency number if you or someone else has any of the symptoms of difficult breathing, in the Symptoms section above. Also call your provider if your child has a cough and is making a barking sound. If you have a history of severe allergic reactions, carry an epinephrine pen and wear a medical alert tag. Your provider will teach you how to use the epinephrine pen. If you have asthma or allergies, eliminate household allergy triggers like dust mites and mold. DO NOT smoke, and keep away from secondhand smoke. DO NOT allow smoking in your home. If you have asthma, see the article on asthma to learn ways to manage it. Make sure your child gets the whooping cough (pertussis) vaccine. Make sure your tetanus booster is up to date. When traveling by airplane, get up and walk around every few hours to avoid forming blood clots in your legs. While seated, do ankle circles and raise and lower your heels, toes, and knees to increase blood flow in your legs. Clots can break off and lodge in your lungs. If traveling by car, stop and get out and walk around regularly. If you are overweight, lose weight. You are more likely to feel winded if you are overweight. You are also at greater risk for heart disease and heart attack. Wear a medical alert tag if you have a pre-existing breathing condition, such as asthma. Parsons MS, Stachecki RP, Wippold FJ. Diagnostic imaging of the larynx. In: Flint PW, Haughey BH, Lund V, et al, eds. Cummings Otolaryngology: Head and Neck Surgery. 6th ed. Philadelphia, PA: Elsevier Saunders; 2015:chap 105. Rose E. Pediatric respiratory emergencies: upper airway obstruction and infections. In: Walls RM, Hockberger RS, Gausche-Hill M, et al, eds. Rosen's Emergency Medicine: Concepts and Clinical Practice. 9th ed. Philadelphia, PA: Elsevier; 2018:chap 167. Thomas SH, Goodloe JM. Foreign bodies. In: Walls RM, Hockberger RS, Gausche-Hill M, et al, eds. Rosen's Emergency Medicine: Concepts and Clinical Practice. 9th ed. Philadelphia, PA: Elsevier; 2018:chap 53. The epiglottis is flap of cartilage located in the throat behind the tongue and in front of the larynx. 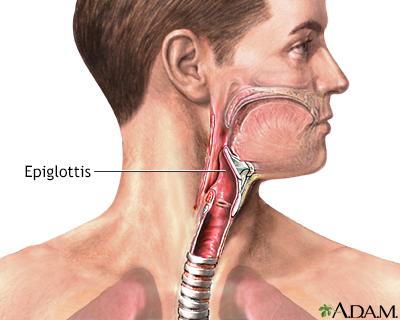 The epiglottis is usually upright at rest allowing air to pass into the larynx and lungs. When a person swallows the epiglottis folds backward to cover the entrance of the larynx so food and liquid do not enter the windpipe and lungs. After swallowing the epiglottis returns to its original upright position. Breathing consists of two phases. The first phase is the inspiration phase. Inspiration allows air to flow into the lungs. The second phase is expiration. Expiration involves gases leaving the lungs. 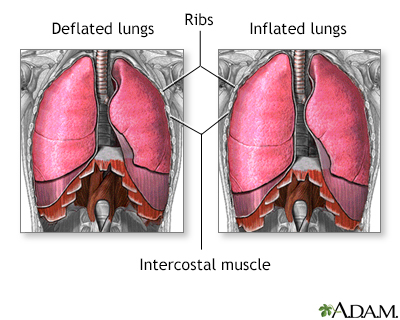 During inspiration, the diaphragm and intercostal muscles contract allowing air to enter the lungs. During expiration, the inspiration muscles relax forcing gases to flow out of the lungs.